Life safety system establishment required ensuring the life safety of organization’s employee & visitors utilize its facility at various workplaces of organization. Life safety: Life safety system is part of management system. The system establish for manage safety in organization. Life safety system for all employee, visitors (including temporary workmen) are entering in facility for various reasons. Organization must establish & deploy the procedures, guidelines, instructions and other media. To ensure that the life safety at workplace. It is obvious that, some visitors are entering in facility for individual interests, and work concern. Life safety system is provides facilities and guidelines for all employees to support all actions. And gives assurance the safety of employees by managing appropriate actions such as precautions for safety. Life safety system is covered all the organization’ workplaces. Which are managed according to management implementation of workplaces, training and enhancement of resources in organization. The management team is discussing about the scope of life safety. But generally the scope of life safety system should not limited. Hence the applicability of life safety system should be implement all the work areas. Supporting processes are require to covered and same the implementation needs at various processes, locations or workplaces. The life safety fundamentals should be applicable to all departments, locations, areas and workplaces. All applicable regulations, laws and requirements of government’s acts as per life safety concern requirements. Also maintain general requirements like insurance & concern guidelines. Safety requirements and its programs are managed & implement in organization. The life safety system should be properly implemented in organization. The management should be allocated proper resources and provisions for safety to each employee at the facility. To see the safety concern, and to managed requirements of equipment to fight against fire emergency, signboards, lighting facility etc for emergency incidents. The organization should be managed proper plan for to draft of emergency situation, evacuation planning, mapping of each locations and areas. Where safety equipment is installed should be cleared indicated at appropriate places. Each employee should be aware about those locations in organization. For the emergency situation organization should be displayed emergency route map. Emergency exit door and ways, lighting & other emergency equipment are deployed. Proper training provided to emergency fighting team. Same the mock drill for each possible emergency are conducted in organization implemented accordingly. Documents Requirements of inspection of life safety requirement. To ensure life safety system properly works in organization. As well as procedures, guidelines, instruments, signboards etc., are properly managed and peoples are follows strictly. The important part of inspection is to verification of each department for personal protective equipment are deployed as well peoples are use in regular tasks. Training Documents is important part of any standards system. Peoples should well educated for any procedures for handle in manufacturing / supporting process activities. The organization should manage training as annual planning, half yearly or making the calendar for verification & inspection. Each tasks that require training to each employee at appropriate designation. The general documents for training are training attendance & its proper evaluation documents are managed. Individual training / on job training, training needs identification, annual training and budget of training hours are general documents for training concern. The safety requirements some specific training required. Such as evaluation planning and its education, fire extinguisher training, first aid box training etc. Its training are needs as and when required and selected personnel with general awareness to all employee working in organization. 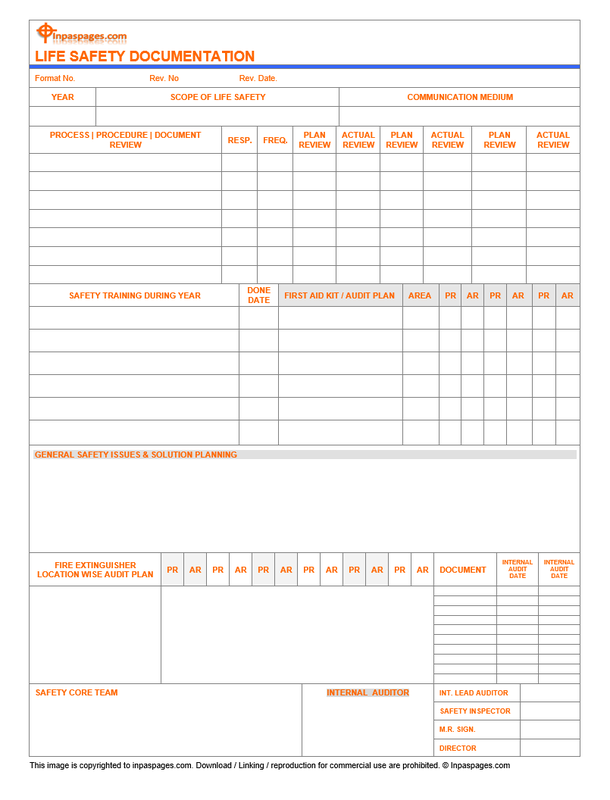 Daily safety walks sheet / Daily inspection checklist. Fire extinguisher register / inspection / monitoring checklist. Earth pit resistance test / record. Work permit – Electrical / Working on height etc. Hazardous waste generation / identification and risk assessment documents. Accident / Incident and near miss reporting. Emergency evaluation plan / Mapping / sign board etc. Safety committee / cross function team management. Legal compliance documents concern safety. Internal / external audit documentation and compliance records. Safety meeting on various levels. First aid register / monitoring / audit. Crain / lifting parts / equipment inspection / documentation. Material handling / equipment records & inspection documentation. Hazardous materials identification like chemicals monitoring and documentation. Serious violation monitoring / documentation. Above mentioned all documents are general and minimum required to manage life safety in the organization. As requirements of organizational individual requirements. The documents you can be add in this list. Its all depends on working environment, product & management system. Release notes, describes final stages and new enhancements.